Whether it’s building a custom greenhouse from scratch or simply replacing one or more broken panels, trust All Glass and Glazing to deliver the market’s highest-quality products. As established glazing specialists serving the North West of England, we know exactly what it takes to manufacture and supply premium-quality greenhouse glass that goes the distance. Our innovative and personal approach to glass production manufacturing allows us to create fully-tailored and bespoke products for public and trade customers alike. Over the years, we’ve helped with hundreds of projects ranging from simple domestic greenhouse repairs to the construction of enormously ambitious growing facilities. Whatever your needs and budget, All Glass and Glazing offers the total service package. When choosing glass and glazing products that are destined to be exposed to the elements day in and say out, quality counts. While it’s perfectly possible to pick up generic greenhouse glass for next to nothing these days, bargain-basement isn’t always the best way to go. At All Glass and Glazing, we personally manufacture and finish every greenhouse glass panel we supply – our guarantees of supreme quality and value for money backing every product across our range. 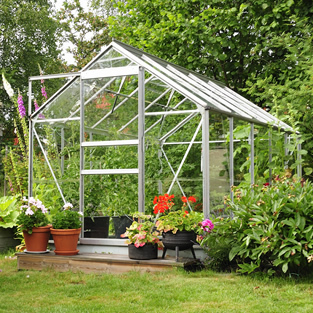 We supply greenhouse glass that doesn’t just perform, but goes on performing indefinitely. As is the case across our product range in general, we only ever put our name to glass products that are a cut above the average in every way. All Glass and Glazing was established as a small yet ambitious family business and remains unchanged to this day. As a small and fully independent business, we’re able to offer 100% impartial and objective advice to all of our customers, injecting that all-important personal touch to our service packages. We treat all customers and queries with the same priority, regardless of the size or nature of the project. So whether you’re looking to design a greenhouse from scratch or simply need a couple of replacement panels, we’d be delighted to hear from you. Get in touch with our service team today on 0161 427 7800 for more information, or to discuss an order.